Jon Scieszka’s new series for middle-grade readers, Frank Einstein – about a boy the author calls “a 10-year-old genius, a tinkerer” – launches this fall from Abrams/Amulet. 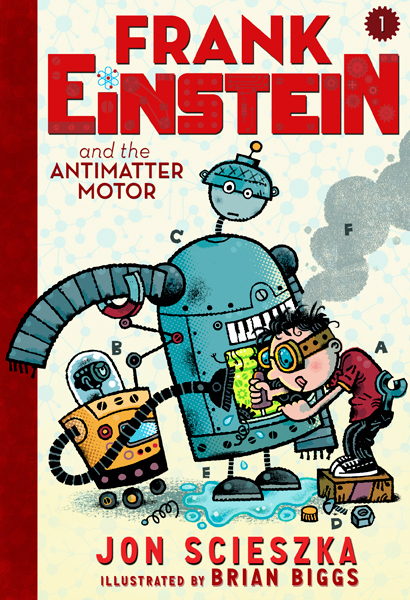 Here’s a first look at the cover of book one, Frank Einstein and the Antimatter Motor, illustrated by Brian Biggs. Frank Einstein, Scieszka said, is always eager to explore how things work, and to apply his imagination to his own special brand of inventions. In the first of what the author describes as “action science adventures,” a bolt of electricity from a lightning storm zaps to life Klink and Klank, two robots Frank has crafted in his garage. The stage is set for this trio to work together, as well for them to do battle with Frank’s archnemesis, T. Edison. Illustrator Biggs (the Everything Goes picture books; the Brownie & Pearl series), he added, was up to the task. “This is something new to him, too. It’s not just the illustration of a story. The diagrams have to look separate and different from the rest of the illustration.” Scieszka also praised the design team at Abrams. “They are so conscious of design and they just understand that it’s part of the storytelling, too. They’ve done it so well with Wimpy Kid and Origami Yoda. I have the easy part. I just write things like ‘insert gamma-ray production diagram here,’” he says.